Joe Johnson was an ordinary bloke with an ordinary life, until his world was turned upside down when the unbelievable, and most unlikely happened. He won the national lottery! But he didn't want money to buy him love, not at any cost... Overnight, Joe went from practically penniless despair to living life in the fast lane with £10 million to his name. From then on it was nothing but the best, it looked like Joe had it all. But despite the jetset lifestyle there was one thing missing in his life; true love. Since his win, a string of intense yet failed relationships had hurt Joe (not to mention his wallet) very badly. A wiser (yet poorer!) man, Joe met and fell in headoverheels in love with Lisa, a beautiful blonde who took his breath away. This time around, he was determined not to be made a fool of, so to ensure Lisa would love him for who he was, not his bank balance, Joe hatched an incredible plan to test her love for him; he'd pretend to be broke and steel himself for her reaction on discovering that she had been deceived. What followed reads like a fairytale. The lengths to which Joe went to keep his secret are amazing he even made Lisa pay the bills and took her on a holiday from hell to a cockroachinfested apartment! But the outcome of the tale was more sensational than Joe could have ever imagined... 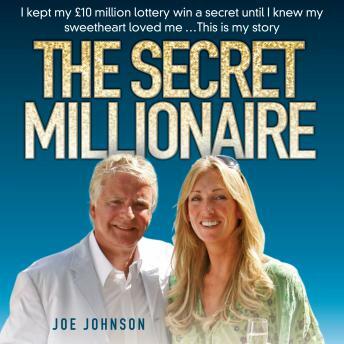 The Secret Millionaire is a heartwarming and hilarious tale, and the story of Joe is one of the most astonishing you will ever read. Perfect for lottery winners and nonlottery winners alike!